To celebrate the return of Starbucks red holiday cups in New York City, New York customers who buy one holiday beverage and can get another one free getting this BOGO deal from November 10-14 from 2-5 p.m. Starbucks has unveiled their 2016 holiday red cups, featuring 13 winter-inspired designs that were created by customers. Starbucks is unveiling its holiday coffee cups for this year and appears to be bringing back snowflakes, candy canes and other holiday symbols, after last year’s more subdued red cups caused an uproar from critics who said the chain was part of a so-called war on Christmas. The selected cup designs were picked after Starbucks invited customers to share their own unique cup art on Instagram in December last year. 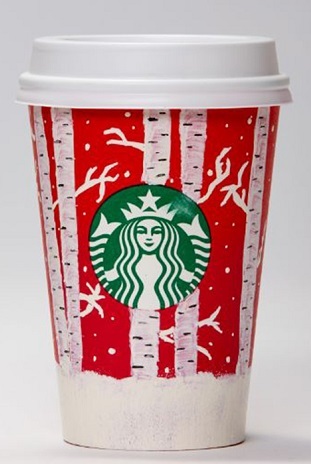 Last year, Starbucks had plain red holiday cups, with some customers using their cups as canvasses for creative art designs. Starbucks will offer the BOGO deal in all stores November 10-14 from 2-5 p.m. The deal is good for a free drink of equal or lesser value. It applies to hot, iced and blended holiday beverages including: include: Chestnut Praline Latte, Peppermint Mocha and Skinny Peppermint Mocha, Caramel Brulée Latte, Gingerbread Latte, Eggnog Latte, Teavana Joy Brewed Tea, and Spiced Sweet Cream Nariño 70 Cold Brew. From Nov. 10 to 14, buy a holiday drink and get a second one for FREE (of equal or lesser value) from 2 p.m. to 5 p.m. at participating cafés.